A screened-in porch is the best of both worlds—all the comfort of the indoors with the fresh air and exterior views of the world beyond the windows. But extreme temperatures can make it difficult to use your porch year round. After all, sweating or shivering is no way to enjoy the outdoors! Thankfully, there are ways to take your dining, lounging, and entertaining outside—no matter what the weather has to say about it. With these expert heating and cooling solutions, your screened-in porch can be a paragon of comfort, whatever the temperature. Read on for some of our favorites. 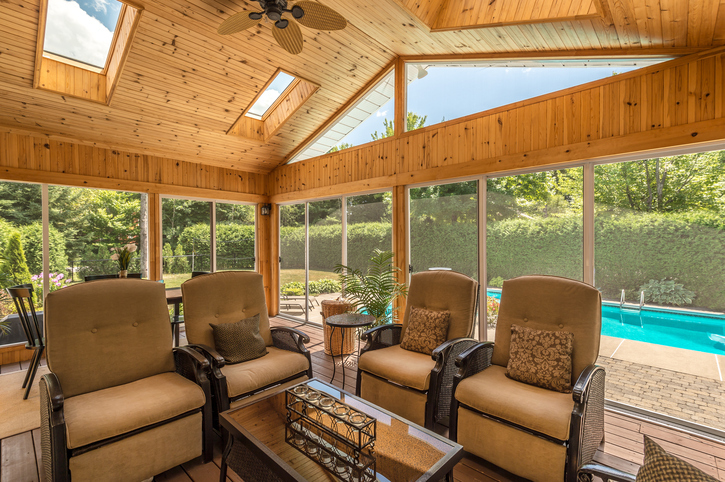 Summertime is where your screened-in porch really shines, but in the dog days of summer, it can be difficult to enjoy your outdoor areas—even in the evening, depending on where you live. Use one of the methods below to help you stay cool outside throughout the worst summer heat. Ceiling Fans. An outdoor porch classic, ceiling fans use fewer watts of energy than a window AC unit for a practical cooling solution. Look for an outdoor model that has a wet- or damp-rating—that way your fan will be able to handle some moisture exposure in case of heavy rains. Evaporative Coolers. Also known as “swamp coolers,” these small air conditioners use humidity to cool small areas. Air is blown over water droplets, causing them to evaporate. The result of the evaporation is that the air surrounding the cooler is chilled. These coolers work well in dry areas and are significantly energy-efficient, but they’re not recommended for high humidity climates. Exterior Porch Shades and Solar Screens. If you live in a more temperate area, a well-designed screen or shade may be all you need to enjoy your porch year-round. Porch shades typically include built-in brackets to keep them from moving in the breeze, and they come in heavy-duty fabrics that are built to withstand the elements and shade from the sun. Screens, on the other hand, allow some light into the porch, but they reflect back the majority of the heat. Heating a porch efficiently—and safely—used to be something of a challenge. Conventional electric space heaters drove up energy bills, while propane was more energy-efficient but highly flammable. Luckily, newer heating options provide comfort, efficiency, and safety all at once, so you can enjoy your outdoor living spaces regardless of what the weather has planned. Here are some of our favorite options for eco-friendly outdoor heating units. Portable Freestanding Heaters. These look similar to tall lamps (there are even some available that are designed to look like old-fashioned Tiffany lamps or ornate lanterns), except they feature a heating system rather than a bulb. Heat is typically electric, although there are natural gas and propane models on the market. Still, these generally aren’t well-suited to screened-in areas, since they require highly-flammable fuels in order to operate. But in terms of efficiency, electric heaters generally can’t get the kind of BTUS-per-pound that you’ll see with other fuel sources, such as gas-operated models. In fact, if you don’t select them carefully, they can easily rack up quite a bill on your utility statements. But they’re ideal for small areas—just make sure you get the right BTUs for your square footage and average winter temperatures. Ceiling- or Wall-Mounted Heaters. Infrared mounted heaters get high marks for their safety, and they are one of the more powerful types of electric heaters available. They’re an excellent choice if you don’t have a lot of available floor space on your porch, or if you’re concerned about young children or pets knocking into a standing heater. These types of heaters use radiant heat to warm a room, so they have a soft, warm heat that’s similar to the sun shining down. Tabletop Heaters. A tabletop heater makes a great choice for a patio table or other seating area, especially if guests will be crowded in close. These heaters have a lower heat output than a wall-mounted or standing model, though, so don’t expect them to heat a whole room (i.e., don’t get stingy with the blankets!). Still, if you just want to use your outdoor area for seated gatherings and dinners, these can be a wonderful addition for 360-degree heating. Fire Pits. Although these are not typically recommended for enclosed porches, tabletop firebowls may be appropriate, as well as some gas fire pit tables. These are typically sunken or covered with glass or volcanic rock for protection. Even so. You’ll also need to check with local building codes before using one in an enclosed area—as well as ensuring that flammable materials are kept well away—so this would probably only work well on a large porch. Additionally, you’d need to make sure that you had proper ventilation for fumes, as well. Passive Heating. There are, of course, ways to add warmth to your screened-in porch without purchasing a heater. The most popular method involves installing clear vinyl around the inside of the screen. This temporarily insulates the walls and keeps the warmth inside. It works particularly well if you combine it with some sort of heater inside. 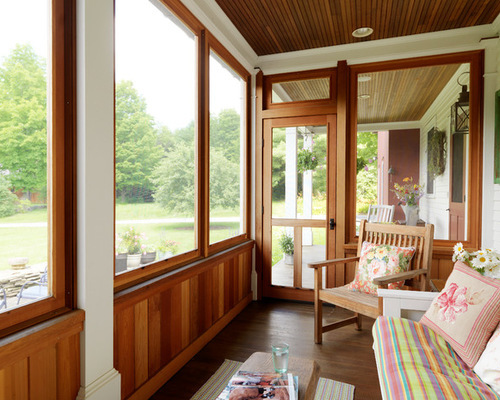 Have you had success with another heating or cooling option on your screened-in porch? Let us know in the comments!